Lazy Seamstress: No more Alice Cooper eyes for me. No more Alice Cooper eyes for me., originally uploaded by indiaeden. Look what I got in the post this morning! Thank you Fiona, you made me smile. We will be meeting our latest little nephew for the first time today. 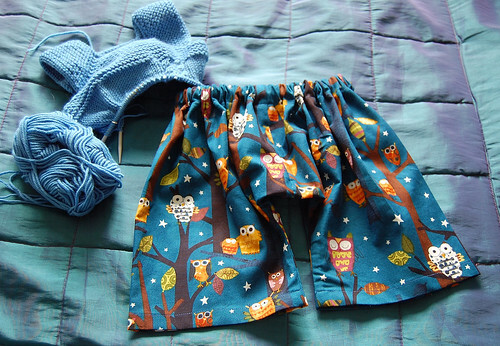 Meanwhile I've been knitting and finished off another little pair of trousers. anything to take my mind off bloomin heartburn...off to find the gaviscon. The little outfits are just gorgeous! The locket necklace with florence's pictures is beautiful and how lovely she is nestled next to her baby brother. I love the Mama and Baby Chicks, I might just take a peek at that link of yours. Gaviscon was sent from hell. Apple Cinder vinegar is still pretty nasty but I found it works really well. One teaspoon in a cup of water. It's only about £1.50 from Holland and Barret for a massive bottle.